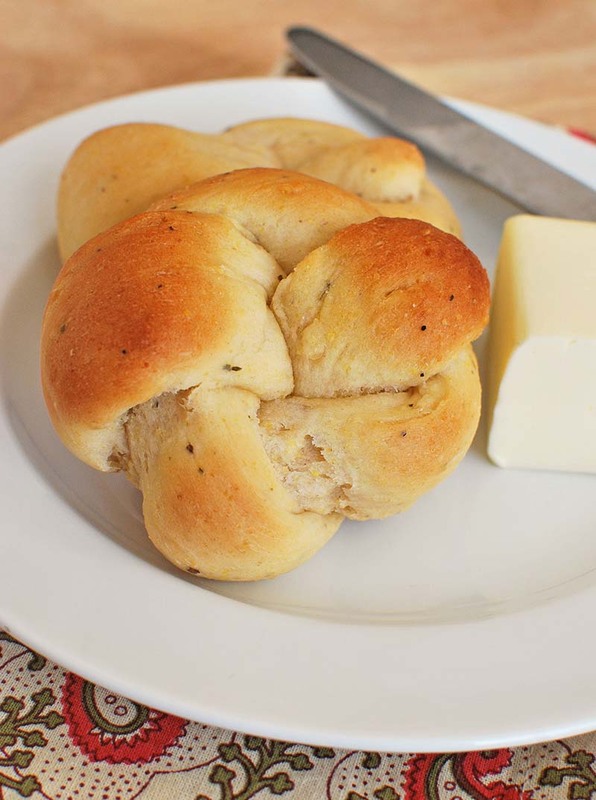 These rolls are a delicious and savory addition to any meal. In large pot over medium heat, or microwave-safe bowl, add oil (or butter), water and milk. Heat to 110-115°F. Pour into a mixing bowl. Add sugar and egg; stir in yeast. Whisk until mixture is smooth. Add flour, cornmeal, onion, salt and seasoning. Stir with heavy wooden spoon. If necessary, work in a little additional flour with your hands until the dough is no longer sticky. Knead on floured surface for 2 to 3 minutes. Place dough in lightly oiled bowl and turn to grease top. Cover; let rise until dough tests ripe. Punch down, cover and let rest 10 minutes. Turn out onto a lightly floured surface. Divide into 24 portions (cut dough into 4 pieces, the cut each of those into 6 pieces). To shape, roll each piece into a 6 inch long rope. Tie in loose knot. Place rolls into greased 9x13-inch pan. Cover and let rise until indentation remains after lightly touching. Preheat oven to 375°F. Brush tops with 2 tbsp melted butter or oil. Bake 15 to 20 minutes or until golden brown. Cool on wire rack. **You can substitute Instant (fast-rising) yeast in place of Active Dry Yeast. When using Instant Yeast, expect your dough to rise faster. Always let your dough rise until ripe. Traditional methods: use equal amounts; Bread Machine: use ½ tsp Instant Yeast OR ¾ tsp Active Dry Yeast per cup of flour in your recipe. Visit our Lessons in Yeast & Baking for more information. Recipe featured at Fake Ginger. I’d like to make these early for Thanksgiving. Is it possible to freeze them either before or after baking? If before baking, do I just thaw them Thanksgiving morning and stick them in the oven for a few minutes to warm them up? Thanks very much! It is best to par-bake yeasted rolls. To par-bake rolls, bake them at 275-300°F for about 20 minutes or until the crust begins to form, but before it starts to brown. The next day, or when you will serving them, bake them at the normal baking temperature until they are the desired color. Made these tonight for a family dinner tomorrow. Oh my goodness! I am going to have to make another batch. My husband and I had to try them…..and….oops…we no longer have enough for our dinner tomorrow! Light, fluffy, the herbs are wonderful. No need to put additional butter on these rolls. They are delicious!